Which type of filler suits me best? What is NMF (Natural Moisturizing Factor)? Drinking enough water? How much is enough? Why some people drink a lot of water and yet still have dry skin? What medical conditions can cause dry skin? What are the complications of dry skin? When to visit a doctor for dry skin problem? What are the supplements that you can use for dry skin? The epidermis is the outermost layer, which contains the skin cells, proteins and pigment melanin. The melanin producing cells (melanocytes) are present in the basal layer of the epidermis. The dermis is the middle layer, which contains the blood vessels, hair follicles, oil glands and nerves. The middle layer provides nutrients or food to the outer layer of the skin. The subcutaneous layer or the fat layer lies beneath the dermis and contains blood vessels, fat, hair follicles and sweat glands. In fact, each layer of the skin also contains collagen and elastin fibres (connective tissue), and these provide support, strength and flexibility. 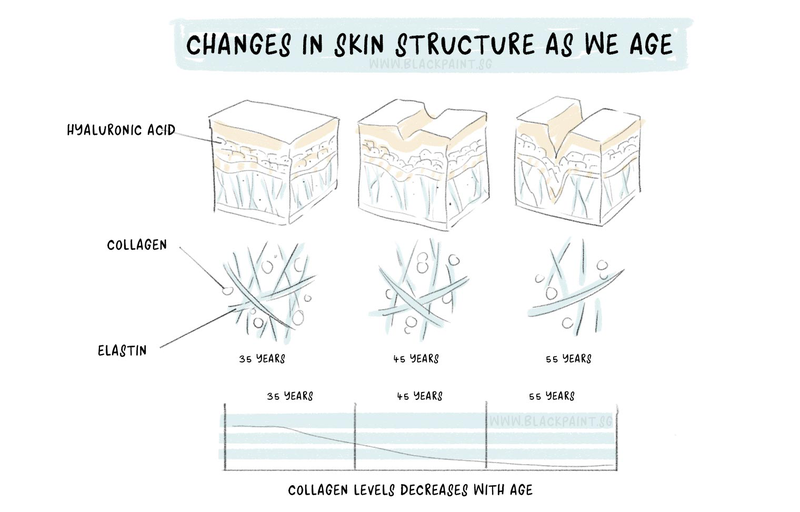 As you age, the epidermis or the outer layer of the skin thins, though the total number of skin cells remains unchanged. The total number of melanocytes (cells that produce the pigment melanin) reduces. The cellular size of the melanocytes increases. Due to this, the skin of an aged person has less protection from harmful ultraviolet rays of the sun. In comparison, the skin of an aged person looks thinner, more clear or translucent and paler. As a result of exposure to sun rays, there will also be the appearance of large hyperpigmented spots called age spots or liver spots or solar lentigos. Connective tissue changes decrease the elasticity and strength of the skin. This is called elastosis and is typically more pronounced in areas exposed to the sun. Elastosis results in the weather-beaten, leathery appearance of the skin that is common to sailors, farmers and other persons who remain outdoors for long hours. Due to aging the blood vessels present in the middle layer of the skin becomes fragile. This may result in conditions such as easy bruising, cherry angiomas and senile purpura (bleeding under the skin) etc. As you grow older, the oil glands start producing less oil (known as sebum). The change is more marked in females often starting post menopause; whereas, in males, this change occurs after 80 years of age. This results in symptoms of itching and dryness. The dermis also thins and the underlying subcutaneous or fat layer is also lost. Due to this, there is the appearance of sagging skin and wrinkles. Greying or whitening of hair is another sign of old age. The total number of nerve endings present in the skin reduces; hence, as you age your sensation is decreased. The total number of blood vessels and sweat glands present in the skin also reduce with age. This decreases the ability of the skin to respond to exposure to heat and cold. All these changes in the skin make it more prone to damage and healing slower. Sun damage causes the majority of the changes in the skin that people associate with old age. When you are exposed to the harmful ultraviolet rays of the sunlight for long-term you get various age-related changes including wrinkles (both coarse and fine), hyperpigmented spots (solar lentigos), and rough and dry skin. Due to old age, the total quantity of skin flora also decreases. According to a study published in ‘The Journal of Investigative Dermatology,’ levels of anaerobic and aerobic bacteria residing on the face show a pattern related to age. The quantity of aerobic micrococci and anaerobic diptheroids is higher in infants in comparison to children. The quantity of these microorganisms increases during puberty and late adolescence. The counts become highest during early adulthood. They remain constant till old age when they start declining. The changes in the quantity of skin flora correlate with sebum production. Skin flora is vital for maintaining the health of your skin. It does so by preventing the growth of pathogenic microorganisms (providing immunity), acting as a barrier to environmental toxins and allergens, minimizing oxidative damage caused by free radicals, promoting healing of wounds and keeping the skin plump and moist. With old age, the quantity of skin flora declines and your skin becomes prone to infections and allergies. The immunity provided by the skin flora begins to decline, and hence, the skin becomes dry and itchy. As a result of the loss of elasticity and firmness of the skin over time, wrinkles in the form of crinkles, creases or furrows become present in your skin. They are a usual part of becoming old. They are also prominent on areas that are exposed to the sun including the neck, face, forearms and hands. Although the structure and texture of your skare are mainly determined by genetics, exposure to the sun is the main cause of the formation of wrinkles, particularly in fair-skinned individuals. Other factors including smoking and pollutants can also contribute to the formation of wrinkles. They are the creases and lines, which form in the skin over time. Certain wrinkles may form deep furrows or crevices and are particularly noticeable around the eyes, neck and mouth. A variety of factors cause wrinkles-some of these are under your control and others are not. Some ethnic groups such as the Irish, English and Scottish people are more prone to get wrinkles in comparison to dark-skinned ethnic groups. As your age increases, your skin loses its elasticity and becomes more fragile. In addition, the production of oil or sebum in your skin is reduced, which dries the skin making it appear wrinkled. The amount of fat in the subcutaneous layer of the skin also diminishes. Therefore, sagging, loose skin and appearance of prominent crevices and lines ensue. Ultraviolet (UV) rays exposure (whether by tanning booth or sun) hastens the natural process of aging, which is the main cause of early wrinkle formation. 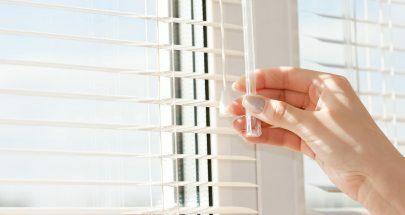 Exposure to ultraviolet rays breaks down the connective tissue of your skin-elastin and collagen fibres, which are present in the middle layer of the skin (dermis). When the supporting connective tissue fibres are not there, the skin loses its flexibility and strength. It starts to wrinkle and sag prematurely. Smoking also hastens the natural process of aging of the skin and contributes to wrinkle formation. This may occur as a result of changes in blood circulation to the skin. Facial expressions and movements such as smiling and squinting may result in the formation of wrinkles and fine lines. Every time you use a muscle of the face, a groove or depression forms beneath the skin’s surface. As your skin gets older, it becomes less flexible and is unable to come back to its place. These depressions and grooves; therefore, become permanent wrinkles on your skin. Where the superficial muscles of the face are paralyzed. Where depressions are filled to elevate them. Removal of excess skin by surgery. Retinoids are Vitamin A derivatives and include tazarotene (Tazorac, Avage) and tretinoin (Retin-A, Renova). You can apply them to your skin and they help to reduce fine lines, roughness and splotches. The retinoids work by remodelling upper dermis as they induce fibroblasts to produce new collagen. Since retinoids may make the skin sensitive to sun’s rays; you should wear sun protective clothing and apply a sunscreen (broad-spectrum) with SPF of more than 30 every day while using retinoids. Some of the minor side effects of retinoids are dryness, redness, tingling or burning sensation and itching. In general, the effectiveness of creams to treat wrinkles depends on the ingredients present. Retinol, peptides and antioxidants present in these anti-wrinkle products may produce modest improvement in wrinkles. However, with nonprescription creams, the results are generally short-lived and limited as less amount of active ingredients are present in them in comparison to prescription creams. Today, a variety of other techniques including Botox, facelift, injectables, fillers, etc. are available to treat your wrinkles. Each technique has its own potential benefits and adverse effects. According to certain studies, a combination of different treatments provides the best results. This is a superficial peel in which very slight difference is observed in the appearance of fine lines. In these peels, your physician applies ingredients such as trichloroacetic acid and salicylic acid to the affected skin. As a result. the outer layer or epidermis of the skin is burnt and removes age spots and wrinkles. You may require mild sedation during deep peels. You may require several peels before you notice a difference. Redness from the peel may last up to few weeks. Microdermabrasion is a minimally abrasive treatment, which uses an instrument to sand the skin gently to remove the uneven, thicker outer layer of the skin. It helps in reducing the appearance of fine lines, wrinkles and stretch marks. It also helps in exfoliating your skin and results in a younger looking, refreshed complexion. There are 2 types of microdermabrasion treatments. During one approach a hand-held device streams or propels tiny crystals of sand across the skin. A vacuum attached to the device suctions the crystals of sand back in the device simultaneously along with the exfoliated dead skin. In the newer and second approach, a diamond-tipped wand moves across the skin gently to exfoliate it and removes the epidermis or outer layer of the skin. It also stimulates the growth of new skin cells and collagen. Each treatment session lasts for about half an hour. During the procedure, you may feel a mild sensation of scratching as it removes superficial cells of the skin. Dermabrasion is a surgical procedure that is usually performed under local anaesthesia in combination with a sedative. During dermabrasion, the surgeon uses a hand-held device that contains diamond particles (resembling a drill) or rough wire brush to scrape the epidermis or the topmost layer of your skin. In place of the old skin, a new skin layer grows that is free of wrinkles. Swelling, scabbing and redness may last for a few weeks. You have to protect the treated skin from the sun’s rays for at least 6-12 months. It may take about 3 months for the pink colour of the skin to fade. In laser resurfacing (ablative), erbium and carbon dioxide lasers are used to direct laser beams to the affected area. The physician uses laser beams for so much time on the affected area that it destroys the epidermis and also damages or heats the dermis. This helps in stimulating the synthesis of collagen fibres; therefore, plumping up the sagging and loose skin, fine lines and wrinkles. For maximum improvement, the procedure may require repetition. Usually, it may take several months for the skin to heal after laser resurfacing. Risks of this procedure are scarring and darkening or lightening of the colour of skin. New techniques like fractional resurfacing work by modifying traditional or conventional laser resurfacing techniques. In contrast to the other treatments, this targets only spots on the skin that are evenly spaced surrounded by intact skin. Additionally, healing is quicker in comparison to traditional resurfacing and the downtime afterwards is lesser. You will still require several sessions to notice satisfactory results. 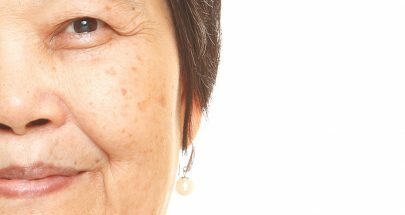 New laser techniques stimulate the synthesis of collagen beneath your skin without causing damage to the epidermis. It is suggested by clinical experience and studies that although such procedures may help in improving fine wrinkles, they are not as beneficial as laser resurfacing. You will need several sessions to get optimum results. Non-ablative laser resurfacing technique is suited to individuals who have moderate wrinkles as the results of this technique are subtle. These treatment procedures cause little to no pain, peeling, redness or downtime. Another noninvasive treatment for wrinkles is to heat the tissues using infrared sources of light and radiofrequency devices (Thermage and Polaris WR). These devices work by heating the collagen and denaturing and shrinking the protein. This produces a skin-tightening effect. These techniques of treatment are still under development but results suggest that these treatment procedures are safe to use and they can produce lasting and visible improvement. Botox (Botulinum toxin) is obtained from a bacterium. It is typically used as an injectable to reduce or eliminate wrinkles and fine lines on the face temporarily. By blocking the nerve signals to facial muscle in which it is injected, the targeted muscle is thus unable to contract resulting in reduced facial wrinkles and fine lines. With the use of a very thin needle, your physician injects small quantities of Botox into specific facial muscles. Your face has 43 muscles and it is important to note that the individual who is performing the treatment understands the exact spots for optimum results. By choosing specific facial muscles carefully, your physician weakens only those muscles that produce wrinkles and preserves your natural expressions of the face. In general, the procedure takes about 15 minutes. The total number of injections required depends on the intensity of your wrinkles and the features of your face. For instance, crow’s feet may need 2-3 injections. There is no recovery time after the botox injections and you can do your normal activities soon after the injection. You may see results after a couple of days; however, it may take up to one week for full effects to appear. The improvement lasts about 3-4 months. A wide variety of ingredients are used to fill the furrows and depressions of wrinkles. There exist many types of fillers that are approved by FDA including your own body’s fat cells (known as autologous grafting of fat), collagen (CosmoDerm, Fibrel, Evolence, Zyderm and Zyplast®), hyaluronic acid (Prevelle Silk, Restylane injectable gel, Belotero Balance, Elevess, Juvederm 3 Hylaform, Captique and Juvederm 24HV), a combination of collagen (Artefill) and polymethylmethacrylate beads, calcium hydroxylapatite (Radiesse), Polyalkylimide (Aquamid) and lactic acid (Sculptra). Hyaluronic acid is naturally present in your body. It helps in improving crow’s feet, cheek depressions, nasolabial furrows, worry lines across the forehead and frown lines between your eyebrows. Polyalkylimide is a type of semi-permanent filler which is used by cosmetic surgeons for the treatment of deeper wrinkles like nasolabial folds, plump thin lips, and to replace your facial volume that you lose due to old age. After the injection of the substance, a layer of collagen forms slowly around it in about a month’s time. Lactic acid is a type of synthetic filler that stimulates the production of the body’s own collagen. It helps in filling laughing lines, treating deep nasolabial folds and plumping thin lips. The results with this filler appear slowly after a few months. You may need around 3 monthly treatments to get the desired results. Your surgeon determines, which type of filler is best suited for your wrinkles and what volume of filler is required for your concerned areas. These fillers are injected into the deep wrinkles present on your face and they help in smoothening and plumping them. You may notice temporary redness, bruising and swelling in the area you got the filler injected. Majority of these ingredients require reinjection after a few months to maintain the results. There are many types of fillers that are unapproved including mineral oil and silicone. These are dangerous and you should avoid them. A facelift, also known as rhytidectomy is a surgery, which helps in improving the noticeable signs of old age in your neck and face such as loose and sagging skin, wrinkles on face and development of jowls in jaw and cheeks. Other procedures such as dermabrasion, IPL, laser or peels may be done in combination with a facelift to improve the texture and quality of the skin. All healthy individuals who are nonsmokers and who do not suffer from any other medical condition, which impair healing can undergo a facelift. The procedure is done under general anaesthesia. A facelift can be combined with the injection of fillers or fat for the reduction of wrinkles. A facelift surgery involves removing excess fat and skin from the neck and face and tightening of the underlying facial muscles and also connective tissue. You may experience swelling and bruising for a few weeks post a facelift surgery. It may take about two to three months for your face to feel normal and notice final results. The results usually last 5-10 years. Among these, EPA benefits your skin by delaying the process of aging and reducing the formation of wrinkles. A study done in 2005 and published in the ‘Journal of Lipid Research’ demonstrated that EPA helps in blocking the release of enzymes induced by UV rays, which damage collagen resulting in fine lines and loose skin. Since EPA is an anti-inflammatory agent and an antioxidant, it helps in protecting against damage caused by sun and repairing it. Look for a supplement that contains 120 mg of DHA and 180 mg of EPA. Take 1 capsule with every meal, three times a day. In case you are pregnant, consult your physician, before starting a supplement. After all, during pregnancy, you will be needing more than the above-recommended amount. ALA is a potent antioxidant and it is 400 times more powerful than vitamins E and C combined. You should take 25-30 mg of ALA every day to reduce inflammation, wrinkles and fine lines and improve the tone of your skin. Take it as a supplement as ALA is present in foods in only small amounts. Coenzyme Q10, also known as ubiquinone is naturally produced in your body. It is an anti-inflammatory agent and an antioxidant that helps in fighting free radicals. Due to old age, the elastin and collagen fibres deteriorate gradually (the fibres that maintain the firmness and elasticity of the skin). A slow decline in the production of CoQ10, which occurs with old age may also cause breakdown of these fibres. Taking CoQ10 supplements may decrease the breakdown and deterioration of collagen fibres. Due to its antioxidant effects, CoQ10 also protects your skin from both extrinsic and intrinsic aging. Intrinsic aging occurs due to genetic factors. Extrinsic aging occurs due to external factors such as sun exposure and smoking. The recommended dose of CoQ10 is at least 30 mg per day. People over the age of 40 should take it as its levels reduce with age. Moreover, its natural levels are often lower in females than in males. Grape Seed Extract is regarded as a vital supplement to fight wrinkles. This supplement helps the tissues and cells in the skin to remain hydrated; thereby, preventing dry, thin and wrinkled skin. Grape seed extract helps in fighting free radicals and inflammation and in assisting the rapid turnover of cells; thus leading to smoother, younger-looking and clearer skin. Vitamin C is a potent antioxidant that is immensely beneficial for your skin. It reduces the appearance of fine lines and wrinkles by preventing damage to cells. It is also considered an essential ingredient for the production of collagen as it influences, regulates and stimulates collagen molecules in the skin. Vitamin C also has anti-inflammatory properties. The recommended dosage of vitamin C is about 100 mg every day. Coconut oil moisturizes and hydrates your skin. It helps in restoring the elasticity of the skin. Hence, using it regularly helps in fading away wrinkles and fine lines. Massage organic coconut oil on the affected areas of your face for a couple of minutes using gentle circular motion of your fingers. Let the oil remain on your face overnight. Repeat every night before you go to sleep. Castor is an emollient. It also increases the production of collagen and elastin fibres in your skin. Due to this the fine lines and wrinkles diminish gradually over time. Apply castor oil using a cotton ball to the affected areas. Grape Seed Oil or extract helps in tightening your skin as it supplies the skin with vitamin E, polyphenols and fatty acids. Massage the oil or extract on the affected areas. Leave for some time and then rinse with water. Repeat every day for a few weeks. Argan oil is rich in vitamin E and essential fatty acids. Using it regularly helps in reducing fine lines and wrinkles. Massage a few drops of Argan oil on the affected areas. Albumin, the protein present in egg white helps in tightening your skin and reducing wrinkles and fine lines. It is also good for persons who have oily skin since egg white helps in unclogging pores and absorbing excess sebum or oil from their skin. Gently whisk white of one egg. Apply it on the affected area of your skin. Wash it with water (lukewarm). You can use egg white face mask one or two times a week. Avocado is rich in vitamin C, E, antioxidants (beta-carotene, lutein, alpha-carotene and zeaxanthin) and healthy fatty acids. Due to its antioxidant potential, it helps in protecting the skin from the damaging free radicals. Vitamin C present in avocado also helps in the production of collagen and elastin, which maintains the firmness and elasticity of your skin and prevents the formation of wrinkles. Peel the fruit and remove its pit. Mash its pulp to make a smooth paste and apply it on the affected skin. Leave it for about 25-30 minutes. You can use avocado face mask one or two times a week. According to a review published in the ‘Journal of Cosmetic Dermatology,’ honey helps in keeping your skin juvenile and in retarding the formation of wrinkles. Hence, it is frequently used in various cosmetic formulations. Massage raw honey on the affected areas of your skin for one or two minutes. Repeat this every day and your fine lines and wrinkles will gradually fade away, leaving a youthful and healthy skin. Rosehip essential oil is beneficial for treating various signs of aging including deep wrinkles. The fatty acids and vitamins E and A present in rosehip oil penetrate deep into the skin layers and fade away wrinkles. Massage 3 to 4 drops of this oil on the affected areas of your face until fully absorbed. Leave the oil overnight. Do the massage every night. The vitamin C present in lemon juice helps in the production of collagen in your skin; thereby, fading away fine lines and wrinkles. Mix lemon juice with an equal quantity of honey. Apply this mixture on the affected area of your face. You can apply lemon juice and honey two times a week. Shea butter improves the elasticity and hydrates your skin. It also promotes the synthesis of collagen in your skin. It is a rich source of vitamin E; therefore, it helps in removing wrinkles from your skin. Take some organic Shea butter and massage on the affected areas in gentle circular motions. Massage it every morning after you take a shower. Jojoba oil has great antioxidant properties and is quite similar to sebum secreted by your skin. Hence, the skin absorb it easily. It acts as a lubricant and protects your skin from wrinkling and aging. Massage 3 to 4 drops of jojoba oil on the affected areas of your face. As a rule, massage the oil every day. If you want to age gracefully, then eat healthily. Let’s take a look at foods to include in your diet and foods to avoid for a healthy, younger-looking and wrinkle-free skin. Foods that cause inflammation makes you age faster, such as processed and fast foods, sugar, dairy and gluten. Eating excessive sugar also makes you prone to develop wrinkles and age faster. Hence, avoid such foods. One way to prevent the formation of wrinkles is to keep your skin hydrated. Omega 3, 6 and 9 fatty acids that are present in healthy oils and fats are important as they form a part of the walls of skin cells. When the walls of skin cells are healthy and plump, the skin looks more dewy and hydrated. Some food choices are salmon, flaxseeds, walnuts, coconut oil, chia seeds, avocado and olive oil. One of the causes of wrinkles is the reduction in the quantity of elastin and collagen fibres in your skin as you age. Amino acids present in protein food sources help in repairing and rebuilding these damaged fibres. Food sources of amino acids are meat, eggs, fish, tofu, whole grains, seeds and nuts. Green leafy vegetables such as kale, spinach, mustard greens and broccoli help in keeping your skin healthy and hydrated. Juices of green leafy vegetables also help in letting the body absorb nutrients quickly. As you age, the outer layer of the skin (epidermis) thins and becomes more susceptible to wrinkling and dehydration. Moreover, ceramides production (molecules, which keep your skin firm) also slows down. Plant-based ceramides referred to as Phytoceramides that are present in brown rice, wheat germ, beets and spinach helps in protecting the epidermis. Excessive sun exposure is one of the main causes of wrinkle formation. UV rays of the sun produce free radicals, which damage healthy cells of the skin. Apart from the sun’s rays, eating an unhealthy diet may also do the same. Eat a wide variety of coloured foods that are rich in antioxidants and contain carotenoids such as carrots, kale, pumpkin and tomatoes. These help in protecting your skin and reversing the damage caused by free radicals. It is a rich source of polyphenols and helps in hydrating your skin and protecting your skin from premature signs of aging. Probiotics promote healthy digestion and regulate the number of good bacteria in your gastrointestinal tract. This also helps in making your skin look youthful and healthy. Some of the probiotic-rich foods are sauerkraut, kefir, fermented vegetables and kimchi. Make sure to protect your skin so as to prevent the occurrence of wrinkles by limiting sun exposure. Spend less time in the sun and wear clothing that protects from the sun such as long-sleeved t-shirts and shirts, sunglasses and hats with wide brims. Always apply sunscreen (broad-spectrum) with SPF of 30 or higher before going outdoors even on cloudy days and in winters. Reapply sunscreen every 2 hours or earlier if you are perspiring or swimming. While choosing skincare and cosmetic products, try to select those products that have inbuilt sunscreen (broad-spectrum) so that it provides some protection from the UV rays. Dry skin dehydrates plump cells of the skin that may result in the occurrence of premature wrinkles and fine lines. Though moisturizers are unable to prevent wrinkles, still they can temporarily mask creases and fine lines. Smoking is one of the leading causes of wrinkles. Quit smoking to prevent the occurrence of future wrinkles and improve the texture and tone of your skin. As already mentioned, a diet rich in antioxidants, green leafy vegetables, proteins and omega fatty acids helps in the prevention of wrinkles. Also, avoid eating processed and fast foods to prevent wrinkles. Dry skin is a common skin condition, where there is insufficient moisture in the epidermis or the outermost layer of the skin. The elderly, in particular, are more prone to developing dry skin. It is also important to note that the risk increases after the age of 40 years. As you age, your skin tends to contain reduced amounts of lubricants and oils. According to estimates, greater than 50% of the elderly people suffer from dryness of skin. Areas of the body that are more prone to develop dry skin include arms, hands and lower legs. Heat: Fireplaces, central heating, space heaters and wood-burning stoves all decrease humidity and aggravate dryness of skin. Weather: Your skin is driest in winters when humidity levels and the temperature drops down. Hot showers and baths: The dryness of your skin can become worse by taking hot baths or showers for a long duration. Similarly, frequent swimming, especially in chlorinated water can aggravate dryness of skin. Harsh detergents and soaps: Many detergents, shampoos and soaps may remove moisture from the skin as they have been formulated to strip excess oil from the skin; thereby, worsening dry skin. Other conditions of the skin: If you are an elderly with dry skin and you also suffer from other skin conditions including psoriasis or eczema (atopic dermatitis) then these conditions can aggravate the dryness of your skin. You live in a region that has a dry or cold climate or low-humidity. Your job requires that you immerse your hands in water, like hairstyling or nursing. You swim quite often in chlorinated swimming pools. Dry skin secretes no or little oil, which makes it flaky and dry. Oily skin secretes oil and usually, it has large pores and looks greasy or shiny. It isn’t necessary for dehydrated skin to be dry. Dehydrated skin can be combination, normal or oily skin, which lacks waters and it feels tight. If you have tight skin, it doesn’t imply that it’s dry. When your skin is dehydrated it lacks moisture or water, but it may still secrete oil. In fact, in this state, it may be probably over-secreting oil so that it can compensate for the reduced water content in the skin. Hence, you can easily mistake dehydrated skin for oily skin. People who have oily skin that is prone to acne and who frequently use harsh skincare products that remove the moisture from the skin are prone to develop dehydrated skin. Natural moisturizing factor is your skin’s own moisturizing tool. NMF is made up of free amino acids and their derivatives like urocanic acid and inorganic salts, sugars, urea and lactic acid. The inorganic salts present are the phosphates, citrates and chlorides of sodium, calcium, magnesium and potassium. The NMF is present in the horny layer of the epidermis. The role of NMF is to maintain optimum hydration of the skin. It; thereby, maintains the plasticity of the skin and protects it from damage. Drinking enough amount of water every day is imperative to maintain your general well being; however, it is also important to maintain the health of your skin. Similar to any other body organ skin is also made up of cells, which require water to function properly. Insufficient intake of water will lead to dehydration and it results in dry, flaky and tight skin. Dry skin is at more risk of developing wrinkles. To prevent this, you should drink enough amounts of water every day. Drink at least eight 8 glasses of water per day to help your body remain adequately hydrated. Try to drink it throughout your day; instead of drinking it all in one go. You may not be drinking enough. Though the usual recommended amount is 8 glasses of water per day, some experts recommend drinking half of your body weight (pounds) of water (in ounces) per day. You can increase your intake of water gradually over a period of days, by drinking two glasses of water after waking up in the morning or carry a bottle (750 ml) of water where ever you go. Additionally, you can make it your goal to refill the bottle four times in the day. Consume sea salt along with water daily. Water along with salt (and potassium) helps in regulating the total water present in your body. This implies that when you don’t consume adequate salt, your body is unable to use water properly and it is mostly expelled and flushes out lots of vital electrolytes and minerals along with it. Alcohol has hygroscopic properties as a result of which it extracts water or moisture from your skin. Hence, moisturizing creams that contain ethanol moisturize your skin initially; but, when you apply them repeatedly, the ethanol present in these creams dries your skin. Hence, you are forced to apply more to prevent drying of skin. Any skincare or cosmetic product that has an alcohol content of more than 5% have a drying effect on your skin. Hence, as you get older the effect is seen more as your skin is already dry due to reduced production of oil. If the alcohol content in the product is less than 5% then it may not have a drying effect as this much alcohol evaporates, when you apply the product on your skin. Dry skin and the associated itching may result in secondary infection by bacteria. Bacterial infections can be mild that may resolve on their own or they can be severe requiring treatment with antibiotics. Severe itching results in repeated scratching leading to the ‘itch-scratch-itch’ cycle. The persistence of this cycle results in thickening of the skin in these regions. This may result in two chronic conditions of the skin (localized)-prurigo nodule and lichen simplex chronicus. There is no improvement in the symptoms of dry skin even with best efforts. Dry skin symptoms are associated with redness. Itching and dryness of skin interfere with your sleeping. You have developed infections or open sores due to scratching. You have developed large regions of peeling or scaling skin. When did you start having dry skin? What are the factors that make it worse or better? How are your bathing or showering habits like? They may suggest some diagnostic tests to rule out certain underlying diseases such as hypothyroidism as the cause of your dry skin. One of the best treatments of dry skin is to daily apply an emollient (it is a substance, which prevents evaporation of moisture or water from the skin). Dry skin caused due to aging can be relieved by treatments that are applied externally such as lotions and creams. Quite frequently, dry skin is improved simply by application of a bland OTC moisturizer. The main goal of treatment of dry skin due to aging is to stop itching, prevent water loss and restore hydration of the skin. In case you have severe dry skin your doctor may ask you to use an OTC cream containing urea and lactic acid. You should use only mild strength steroid creams such as hydrocortisone on the underarms, groin and face areas. Applying strong strength steroid creams in the long term may result in serious side effects such as stretch marks, skin breakdown and skin thinning. Apply moisturizers after bathing and several times in a day. Use thicker ones such as OTC brands Cetaphil and Eucerin. You can also use cosmetics containing moisturizers. In case your skin is very dry, apply baby oil when the skin is moist. Oil stays for more time than moisturizers and prevents water from evaporating from skin’s surface. You can also apply thicker products such as Vaseline at night. Creams and ointments are less irritating and more effective than lotions. Opt for an ointment or a cream that have oils like jojoba oil or olive oil. Shea butter is also a good choice. There are other ingredients which help to relieve dry skin, such as glycerin, hyaluronic acid, dimethicone, urea, lactic acid, mineral oil, petrolatum and lanolin. Use gentle and unscented cosmetic and skincare products. Addtionally, avoid using products containing alcohol and fragrance. While bathing use lukewarm water and restrict your bathing time. Long baths and showers, particularly with hot water, strip oils from the skin. Restrict your shower or bath time to 5-10 minutes. Instead, use gentle cleansers and shower or bath gels that have added moisturizers. Opt for mild soaps with added fats and oils. Apply moisturizer immediately after bathing. Gently pat dry your skin using a soft towel and apply a moisturizer immediately, as this helps in trapping water in the skin cells. Dry, hot air in your room can dry your skin and make flaking and itching worse. To prevent this, use a portable humidifier in your room to add moisture into the air indoors. Also, make sure to clean the humidifier to prevent bacterial and fungal infections. Don’t sit in front of a heat source or open flame as it may dry your skin. Vitamin E is a powerful antioxidant and anti-inflammatory that helps in soothing your dry and itchy skin. Fish oil is rich in omega-3 fatty acids, and these help in relieving dry skin. They also help to prevent inflammation of skin; hence, if you are a vegetarian or don’t like fish, take a fish oil supplement. The two carotenoids are potent antioxidants, which have to be supplied by the diet because your body is unable to produce them. Taking a supplement containing these two carotenoids increases the hydration of skin. A low level of Vitamin D causes dry skin; hence, include a vitamin D supplement in your daily routine. Evening primrose oil helps in relieving dryness of skin and keeping skin moist because it is a rich source of essential fatty acids (both omega 3 and omega 6). Apply some fresh gel from the leaf of Aloe Vera on your face and massage it gently, then leave it overnight. As a rule, repeat it every night as the polysaccharides present in Aloe Vera helps in retaining the moisture in your skin and relieving dryness. Apply virgin coconut oil on the affected areas and massage it gently. Apply it one or two times a day. 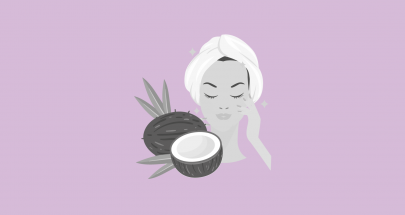 Saturated fatty acids are present in coconut oil that works as an emollient and smooth and hydrate the skin naturally. You can add powdered oatmeal to your bath or use creams containing oatmeal to relieve dryness of skin. Oatmeal extracts have anti-oxidant and anti-inflammatory properties; therefore, it can help in relieving dry skin. According to a review published in a journal of Ayurveda, honey is beneficial for multiple skin diseases. Honey is healing, anti-inflammatory and moisturizing. Hence, it has several qualities that make it an ideal treatment to relieve dry skin. You can apply honey directly to the affected areas and leave for some time. Rinse it with lukewarm water. When you have dry skin, it implies that your skin cells are getting damaged faster in comparison to the speed with which your body is able to repair them. In this case, there are certain foods that may help to maintain the health of your skin. Lipids form an important part of the skin barrier, as they include phospholipids, cholesterol, ceramides and free fatty acids. Without these lipids, water can escape easily, thus allowing the skin to get dehydrated. Polyunsaturated fatty acids (PUFAs) are essential for the synthesis of the lipids present between skin cells. The two kinds of fatty acids, which are essential and should be consumed through your diet, are omega 3 fatty acids and omega 6 fatty acids. Foods rich in omega-3 fatty acids: Fatty fish such as herring, salmon, sardines, anchovies and mackerel and flaxseed oil, grass-fed beef and eggs. Foods rich in omega-6 fatty acids: Borage seed oil, corn oil, safflower oil and evening primrose oil. Drinking milk can also offer relief from dry skin. According to a study published in the ‘Journal of Dermatological Science,’ phospholipids present in milk improved skin barrier in the study mice. Age spots, also known as liver or sun spots are present in people who are more than 40 years of age. The main cause of age spots is exposure to ultraviolet rays of the sun, which trigger melanin production in the skin, resulting in darkening of the skin. After years of exposure to ultraviolet light, melanin pigment builds up in certain areas of the skin leading to the development of age spots. The colour of sunspots ranges from light brown to black. Appear as flat areas of hyperpigmentation and have a similar texture as the surrounding skin. Found in areas that are exposed to sun’s rays such as arms, face, hands, and tops of feet, shoulders and upper back. Your doctor will diagnose them by inspecting your skin. If they suspect any dark spot to be anything other than sunspot, they may do a biopsy. Your physician may prescribe bleaching agents to lighten the sun spots slowly. Typically, these agents contain hydroquinone along with retinoids like tretinoin. You should use sunscreen while using these creams as they make the skin sensitive to ultraviolet rays. These remove the epidermis or outer skin layer so there is a growth of a new layer of skin that is free of age spots. It is a type of non-ablative laser therapy that stimulates collagen growth in the middle layer of the skin and usually produces good results in people with fair skin. In this procedure, the epidermis is removed and in its place, a new skin layer grows which is free of age spots. During this procedure, liquid nitrogen is used to freeze individual sunspots. Lemon juice is rich in citric acid which acts as a bleaching agent; fading the age spots. Apply fresh juice of a lemon on your age spots two times in a day and then leave it for about half an hour. 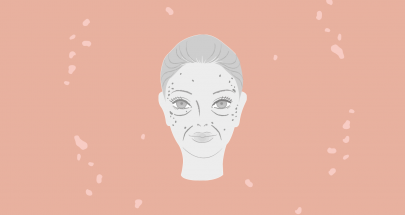 Usually, improvements in your age spots become noticeable after 1-2 months. It contains alpha hydroxyl acids that help to lighten age spots. Mix equal quantities of ACV with olive oil and apply on the affected areas. Leave for 20 minutes and then wash with water. Horseradish is a rich source of vitamin C that slows the production of pigment melanin; thereby, reducing age spots. Make a paste of horseradish and apply it to the affected area. Leave for about 20 minutes and then wash with water. Papaya contains alpha hydroxyl acids and certain other enzymes, which help to lighten age spots and exfoliate dead skin cells. Mash the pulp of papaya. Apply this pulp to the age spots and leave for about 15 minutes. Take fish oil supplements to get plump, hydrated and supple skin. Fish oil supplements contain omega-3 fatty acids that help to strengthen membranes of the skin cells. This ensures that they perform some of their vital functions like uptake of nutrients, and removal of wastes. They also maintain the hydration of skin cells. Drink sufficient water to maintain an even texture, tone and radiance of your skin. Install a humidifier in your room at night and you will notice that you have smoother, plumper, more hydrated skin with fewer lines in the morning. Use egg whites face mask a few times in a week to tighten your skin and brighten your complexion. Add turmeric to your diet to decrease inflammation, as it has anti-inflammatory properties. As a result of inflammation, many signs of aging appear on the skin, including wrinkles, breakouts, saggy skin and uneven tone. Apply moisturizer to your face as many times in a day. Do regular aerobic exercise. Aim for at least 30 minutes of moderate intensity exercise on most days of the week. You can do brisk walking, swimming, cycling, dancing, running etc. Do relaxation exercises such as yoga to relieve stress. Eat a balanced diet with good fats and enough proteins. To protect the skin from excessive exposure to the sun, use a broad-spectrum sunscreen of SPF 30 or higher. Additionally, wear sun protective clothing, a wide brim hat, use an umbrella or seek shade. Reapply sunscreen every two hours and earlier when swimming and perspiring. Apply self-tanner instead of getting a tan. Every time you tan your skin, you are also aging it prematurely. This is also true if you are getting a tan from a tanning bed or the sun. Avoid making unnecessary repetitive facial expressions. While making a facial expression, the muscles lying underneath get contracted. On repeatedly contracting the same facial muscles over the years, the lines get permanent. While cleansing your skin, be gentle. You should avoid scrubbing the skin as it may irritate the skin, which accelerates aging of the skin. Instead, clean your skin gently. Wash your face two times in a day and immediately after perspiring heavily. Heavy perspiration may irritate your skin; hence, wash your face as early as possible after heavy sweating. Don’t use skincare and cosmetic products which burn or sting. Burning or stinging of skin implies that it is irritated, which can accelerate aging of the skin. Use Green Tea to prevent and repair the oxidative damage caused to skin cells by free radicals. Green tea helps in clearing cellular damage and repairs wrinkles and age spots, because of the chemicals it contains known as catechins, which are antioxidants. When you apply green tea to your skin it reduces sun damage by decreasing inflammation and destroying free radicals. You can also consume green tea to reap its health benefits. Quit smoking. Smoking accelerates the aging of your skin, and it can result in wrinkles and a sallow and dull complexion. Engage in regular physical activity. Moderate intensity exercise when done regularly helps in improving circulation and boosting immunity. This helps in giving your skin a healthy and youthful appearance. Eat a well balanced, healthy diets, such as a diet that contains lots of fresh vegetables and fruits, good fats and proteins. Avoid eating a diet that contains refined sugars and carbohydrates as it may accelerate skin aging. Reduce the amount of alcohol you drink. Alcohol dehydrates your skin and accelerates aging of the skin. Hence, drink less amount of alcohol. Women should not drink more than 1 drink per day and men should not drink 2 drinks per day. A summary of causes & treatments available to target hyperpigmentation - one of the biggest concerns in skin aging. Next PostNext Lipsticks: What are in them?